Cars snake through the Sepulveda Pass near the Getty Center on I-405. The stretch is one of the most congested in the country. About a year after Metro completed its improvements of the Sepulveda Pass section of the 405 freeway, traffic has improved, rush hour has shrunk and the number of accidents has dropped, according to a study commissioned by the agency. The study found that while the project has not brought down wait times during rush hour (a previous study found they've actually gone up by a minute), there are reasons to celebrate. After five years of construction — including two Carmageddons, a Jamzilla and countless detours and delays — a carpool lane was added to the Northbound side, two bridges were rebuilt and several on and off-ramps were lengthened. Rush hour has been reduced from seven hours to five. The peak drive period formerly lasted from 2 p.m. to 9 p.m. It's now lost an hour on either side, going from 3 p.m. to 8 p.m. Wait times on Northbound 405 have become less variable, making for easier planning. Wait times during non-peak hours have been reduced. The number of accidents reported has dropped by about 15 percent. Traffic on major arteries in surrounding areas (like Sunset and Sepulveda Boulevards) has dropped between 20 and 25 percent. Capacity has improved: 15 percent more cars pass through on an hourly basis, and use of the carpool lane has translated to a nearly 30 percent increase in the number of people passing through every hour. 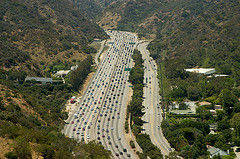 The corridor from Interstate 10 to U.S. 101 near Westwood is consistently ranked among the most congested stretches of highway in the country. Aziz Elattar, who heads Metro's Highway programs, stressed that it's important to look at the project not only in terms of the benefits it gained, but also the hassles it avoided. "If we had done nothing, things would have been a lot worse,” he said. He pointed to study projections that showed a 35 percent increase in wait times had the project not been completed. Phil Washington—formerly of Denver’s transit agency—is now in his first week as head of L.A.’s Metro. Washington was recently grilled by Move L.A., which asked him about the plans for a proposed double- or triple-level tunnel under the 405. With a price tag of about $20 billion—Metro only has $1 billion to pay for it—the agency will need to get creative if they want it see the light of day (or not, it would be underground). Move L.A. asked Washington about public/private partnerships, where a private business builds a public amenity (say a freeway/subway tunnel) and then collects a portion of the tolls or fares that the project generates. PPPs are something Washington used to help expand transit in Denver. 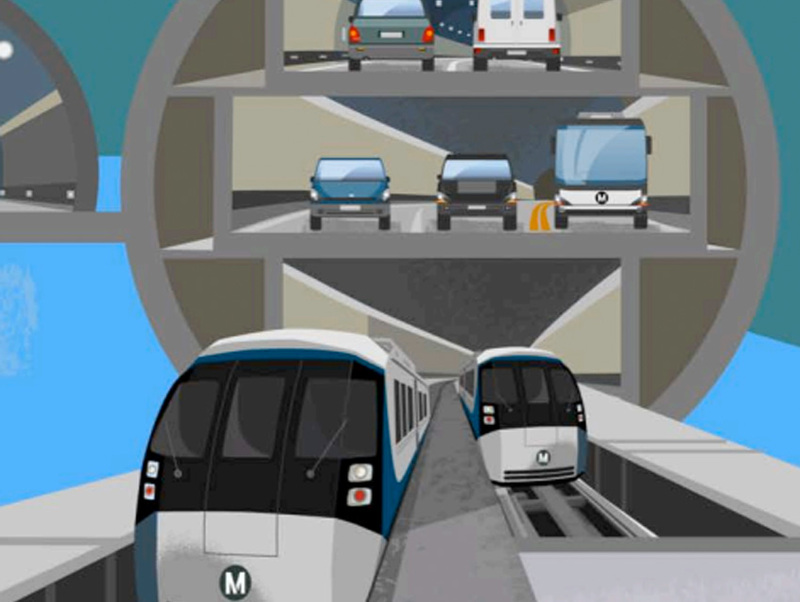 Very early plans for the Sepulveda Tunnel call for a 60-foot tunnel that could accommodate trains on one level and cars on one or possibly two levels; drivers would be charged tolls to access the tunnel. The underground route will link the Valley to the Westside, though where exactly it would connect is not clear. Aside from the proposed P3, Metro is considering placing a half-cent sales tax increase on the 2016 ballot. If it gets approval from two-thirds of voters, it could bring in about $90 billion over 45 years. According to this article the 405 tunnel will cost 20 billion dollars, 60' diameter and 9 miles. The SR-710 , 60' diameter tunnels, will cost 5.65 billion dollars for two 4.7 mile tunnels. Which one is estimated correctly? Actually this doesn't seem like a bad idea, at least it's primarily for commuting. If the adjacent communities approve, it certainly makes more sense than 710 North which is about truck traffic. Let's see how Mr. Washington parses his tunnel projects. The early reports on this project offered several options. The car tunnel only option, without rail of any sort, was estimated at $10 Billion the last time I looked. Still doesn't make sense when you compare it and the SR 710 tunnel together. SR-710 is still estimated at half the cost of the 405 Corridor tunnel. My guess: neither is estimated correctly. Mega projects are almost always purposely underbid and go way over budget. Wow, that project was estimated at $10 B before, now it's $20 B. 710 tunnels originally $1 B, now it's $5.65 B and SCAG estimate $11.8 B. With all these billions of dollars flying around, one has to think irresponsible to say the least of Metro. Maybe the changes in estimates have to do with Bryan Pennington the director of construction who replaced Doug Failing. There were multiple configurations -- some with rail, some with bus lanes, etc. the price depends on which configuration you are talking about. The 10 billion was for the version that is the analog to SR 210 -- no rail and no dedicated lanes. What is described in the article includes other modes. You are right about the inevitable cost overruns. However, for me the larger issue is the lack of internal consistency -- two tunnels of the same diameter and (total) length, and yet SR 710 is estimated to cost half of 405? It leads to the logical conclusion that SR 710 is being purposely underestimated to make it look more attractive and feasible.